U4. Quick SiteMap Maker PRO PLUS ++. 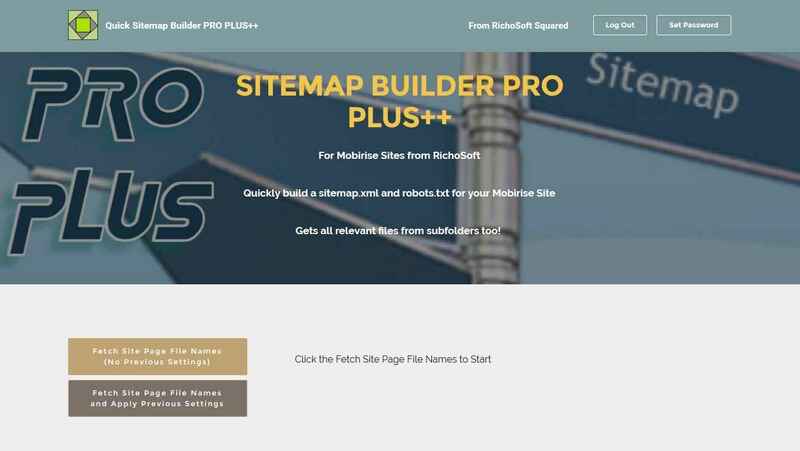 QUICK SITEMAP MAKER PRO PLUS++ System for Mobirise* sites. NEW IN PRO PLUS++ - Displays file icons beside files and folders! NEW IN PRO PLUS++ - Enhanced display! NEW IN PRO PLUS++ - Exclude all files in selected folders/sub-folders with a single click! NEW IN PRO PLUS++ - Save the selected exclusions for fast automatic re-use when sitemap/robots needs changing! NEW IN PRO PLUS++ - Scans ALL Sub-Folders for web pages Too! NEW IN PRO PLUS++ - Automatically Excludes Files and folders that start with _ (underscore) which are usually hidden files and folders. Video shows the PRO PLUS Version PRO PLUS ++ Works similarly but more features.